In a world increasingly orientated towards imagery — be it through the proliferation of Pinterest, emoji, or architecture evermore inclined towards image over experience — it's time someone challenged our perspective on taking such media for granted. The Barbican's new photography show Constructing Worlds does just that, bringing together practitioners with incredible clout to redefine our understanding of the power photos can carry. The exhibition is roughly divided into two sections by chronology. 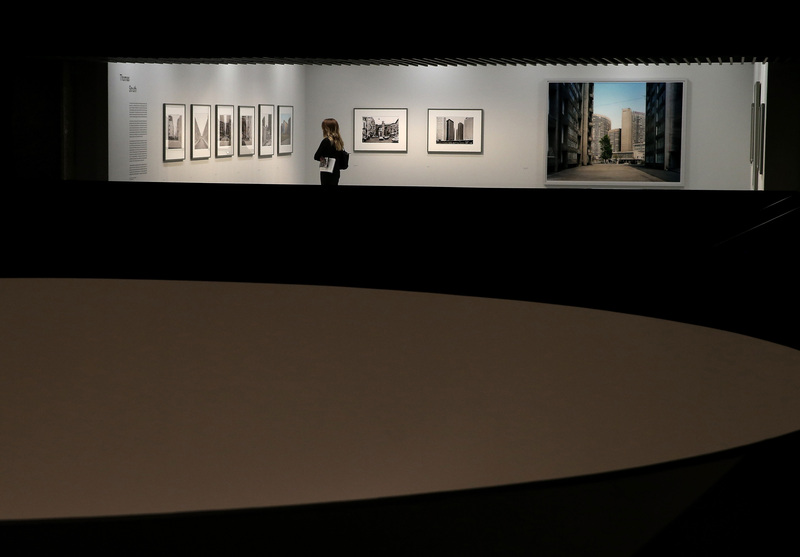 The upper gallery displays past masters including Julius Shulman and Walker Evans, while predominantly contemporary practitioners like Iwan Baan (whose work with Urban-Think Tank documenting life in Caracas' Torre David vertical slum displayed here was awarded the Golden Lion in Venice two years ago) and Andreas Gursky are downstairs. Both halves of the exhibition challenge preconceptions of architecture, imagery and space — further heightened by OFFICE KGDVS's inventive modulation of the gallery interiors. Terminologies of focus, development, process, snapshot and exposure predominate — not just in relation to the technical aspect of taking photographs, but in revealing the particular artist's viewpoint. Bernice Abbott's photos of mid-30s New York are just such a snapshot, capturing a turning point in the city's history — a juxtaposition of contrasts, with past and future, construction and demolition, high-rise and low-rise showing two versions of the city dancing side-by-side at this moment in history. Hiroshi Sugimoto's work, on the other hand, brings a new focus by a lack thereof to the otherwise hackneyed imagery of the Twin Towers, Guggenheim Bilbao and Seagram Building — dissolving the material monumentality in a dream-like manner to revitalise the building's appearance of youth. As is evident in the work of Lucien Hervé's images of Chandigarh under construction by Le Corbusier, the image is key in defining the terms by which the architecture is judged and disseminated. Showing these alongside his famous contact sheets reveals the degree to which the image is constructed and developed, and how these processes went on to define the architecture and the architect's resulting reputation as much as the tectonics of the forms and materials themselves. The monumentality of these images is counterpointed by Nadav Kander and Guy Tillim's work downstairs, reminding us of the transient fallibility of such pristine architecture, and reflecting the otherwise invisible socio-political condition impinging on the Modernist dream. Such images are not just about the product but the process, and Constructing Worlds is as much about the realm of photography as the urban condition it portrays. Constructing Worlds runs until 11 Jan 2015, and is accompanied by a series of artists' talks and tours, which are selling out fast. Tickets for the exhibition £8-12, with an excellent exhibition catalogue priced £35.